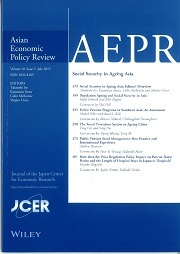 Japan Center for Economic Research (JCER) launched an English journal entitled Asian Economic Policy Review (AEPR) in June 2006. The journal is published twice a year through John Wiley & Sons. Visit the journal website for more information. The latest issue titled "Changing Global Financial and Trading Systems and Asia"(Vol. 13 Issue 2) was published in July, 2018. The 27th conference of Asian Economic Policy Review (AEPR) was held in Tokyo in April, 2018. The theme was "India". The working papers proposed are found here. Changing International Financial Architecture: Growing Chinese Influence? Is China's Development Finance a Challenge to the International Order? While countries like China enjoy their continued fast economic growth and increase their presence in world economy, both U.S. and European countries are starting to focus more on disadvantages of globalization. There is a growing concern that President Trump's protectionist policies such as withdrawing from TPP, threatening to leave NAFTA, hiking tariffs may lead to a trade war. These US actions and uncertainty over "After Brexit" are risks to other countries. Under these circumstances, this issue of AEPR discusses international financial architecture, the future of East Asia's trade, instability in Europe, the impact of Trump's policies, and China's development finance. (2018 Jan.) Did Abenomics Succeed? It has been 5 years since prime minister Abe introduced his economic policy "Abenomics" to lift out Japanese economy from a depressed situation and achieve its revitalization. Abenomics consists of three components: aggressive monetary policy, flexible fiscal policy and a growth strategy. This issue provides rigorous assessment of various aspects of Abenomics. China's financial transformation has become more important than ever as the weight of the Chinese economy in the global economy rises continuously. The issue focuses on various topics including the banking system reform in the country, RBM's internationalization and China's new role in the international financial architecture. The issue comprises papers and comments that address a wide range of labor, health and education-related issue in Asia. The papers focus on analyzing the impact of the policies and regulations on the decision-making of individuals, households and firms, and, thereby, on the education performance and labor market outcomes in Asia. The issue examined a wide range of connectivity and integration issues in developing Asia. Those include the accomplishments to date; the economic impacts of improved connectivity; the challenges to achieving more efficient connectivity; and the type of infrastructure (soft and hard) to improve connectivity and promote deeper economic integration. Sports are a massive economic and social phenomenon. The sports business is developing rapidly. It has both contributed to and shaped globalization. The Olympic Games, the FIFA World Cup and other events have an enormous ideational influence on popular culture and public attitude. It sometimes moves the international relations. This issue addresses the topic of the economics of sports in Asia in several dimensions. Asian emerging-market economies are quickly adopting modern institutions such as a pension system and other social security programs. They face new challenges as their once high economic growth rates are coming down and their societies are aging quickly. The lessons from Japan, which is at the frontier of the global "aging society" trend, should be learnt carefully by those countries. This issue sheds light on questions and problems related to social security. Policymakers in many Asia economies find that an increase in productivity is the way to achieve economic growth. They believe that innovation is a key to increase productivity. A major player in innovation is the private sector, but the public sector plays an important role. This issue takes up the issue of innovation in East Asia with an objective of identifying appropriate policies for promoting innovation. Addresses the impacts of China's rise on the world economy. Various ways of impacts are found, including international trade, direct investment, aid, exchange rate, etc. To examine these impacts of China's rise, this issue begins by focusing on two regions geographically far from China, that is, Africa and Latin America. Then examines China's importance as an international investor, as a country shaping the international governance structure, as a country with international macroeconomic implications of its domestic monetary policy, and as an aid provider. The liquidity trap is a very rare phenomenon, and the current Japanese situation is only comparable with the US experience during the Great Depression. However, similar phenomena took place in the US and European countires during the recent global financial crisis and the European sovereign debt crisis. Why the policy rate hit the zero lower again in Japan and other industial countires since the Great Depression? This may be a big question to be asked. This issue adresses this questions with a particular focus on deflation in Japan. After two lost decades since the early 1990s, the Japanese economy needs radical policy change to avoid further stagnation, which will likely end up in a fiscal crisis. This issue explored the perspectives of Japanese economy from different point of views, such as productivity, Japanese govenment bonds (JGBs) , monetary policy under Abenomics, energy strategy, real exchange rates, and the Trans-Pacific Agreement (TPP). Explored whether ASEAN can achieve its ambitions of economic integration in 2015 while a "Development Divide" is found between founding members of ASEAN and new members, that is, new frontier countries such as Cambodia, Lao, Myanmar and Vietnam. Economic situations of each frontier country as well as regional cooperation in the Mekong region are also discussed. This issue examined the fall and rise of Keynesian fiscal policy, and current fiscal issues under the pressure of the European fiscal crisis spreading from Greece to other European countries. As the European fiscal crisis gives great impacts on not only Euro Zone, but China, Japan and ASEAN countries, each country's (area's) current fiscal situation and policy response as well as the impacts of the crisis are discussed. Contains South Korean economic history with rapid development and sketches out the country's current challenges. These contemporary issues includes growing openness to international capital flows, which has exposed South Korea to the vagaries of international financial crises, industrial policy and the challenges for competition policy, and pensions and safety nets. The issue of the labor market experiences of a group of recent arrivals (refugees) from North Korea is also discussed. Focuses on a number of important macroeconomic and microeconomic issues for Asian finance, including financial openness and inetgration, historical development of the Chiang Mai Initiative Mutilateralization. Asian sovereign wealth funds (SWFs) which is different from SWFs in other regions, and Islamic banking in Malaysia are also discussed. This issue examined economy of the Association of Southeast Asian Nations (ASEAN) characterized by diversity, disparities, and dynamics. We explained in detail how ASEAN's political/social and economic integration has developed over the last 40 years, and also focused on some recent developments in individual members of ASEAN, Thailand, Indonesia, Vietnam, and Myanmar. The role and need for regional frameworks are one of the foci of this issue. The increased representation of Asia is welcomed by Asian countries who have long complained about their underrepresentation in many international organizations and forums. This issue examined what policies might be implemented to reduce greenhouse gases emissions, including international policy framework and multi-level governance on climate change in East Asia. Explored how in the coming years the US may relate to East Asia in areas such as trade, finance, investment, and security, as well as the design and management of regional and global institutions. An assessment of the impact of demographic change in Asia, including long-term predictions looking ahead to 2050 and approaching the issues from the perspectives of economic growth, asset markets, social security, and social politics. An examination of the continuing rapid growth of India's economy, including the role of financial policy, globalizing corporations, and the future of economic reform. A special issue on the inequalities within and between countries in East Asia. In addition to regional analysis of discrepancies between economic growth and the state of healthcare and educational systems, we also looked in detail at the situation in Indonesia and other countries. We also discussed changes in national income since the nineteenth century. (2007 Dec.) Japan: Where To From Here? This issue examined Japan's 15-year-long "lost decade",looking at economic, financial, and industrial policy and suggesting ways ahead for the future. We examined the weak links between free trade agreements and the government's official development assistance policy and the economic stagnation caused by failures of macroeconomic policy. (2007 Jun.) Ten Years After the Asian Crisis: What Have We Learned or Not Learned? Ten years on from the Asian financial crisis, this issue looked at the lessons learned and the issues still to be resolved. We analyzed the role played by the International Monetary Fund in rescuing the region from crisis, examining evidence from various countries around the region. A series of essays examined how the crisis affected each country differently. Contained wide-ranging analysis of the potential for regional economic-based integration in East Asia. As well as examining free trade agreements and international production and distribution networks, this issue also discussed financial cooperation and labor mobility within the region and its impact on regional integration. Examined the Asian and global impact of China's rapid economic development from a diverse range of perspectives. Considered China's recent economic performance and future prospects and the impact on trade of China's accession to the World Trade Organization. In Japan and Asia today, there are few English-language journals that provide a bridge between Japan and Asia, between academia and policy circles, and between economics and the politics of economic policy making. There is a vacuum for a high-quality, but readable journal in Asia. The mission of our new journal is to fill this gap. We envision that our new journal will grow to have a status in Asia similar to that enjoyed by Foreign Affairs or the Brookings Papers on Economic Activities. The goal of this journal is to become an intellectual voice on the current issues of international economics and economic policy based on comprehensive and in-depth analyses, with a primary focus on Asia. As such, articles in the journal will not be purely academic research or political commentaries. Instead, stress will be placed on identifying key issues at the time - spanning international trade, international finance, the environment, energy, the integration of regional economies and other issues - in order to furnish ideas and proposals to contribute positively to the policy debate in the region. Although the principal focus is economic policy issues, when necessary and relevant, international relations papers will also be included. Each issue of the journal features a common theme approved at Editorial Meetings. Followed by the meetings, two workshops will be organized every year (one conference for each journal issue) where authors will present their papers, and then receive comments from designated discussants and from conference participants. This process will guarantee a very high standard of papers appropriate for a first-class journal. The revised papers will be published in the journal, together with a summary of the discussions at the workshop. The editorial team for the journal consists of three Editors, a Managing Editor, a group of Associate Editors, and an Advisory Board. The three Editors will be responsible for content of all articles. The Managing Editor is responsible for ensuring the timely and efficient publication of the journal, and will handle all correspondence between the journal, authors and discussants. Associate Editors will provide advice regarding themes for specific issues of the journal, and make suggestions about possible article writers, participate actively in the workshops where papers will be presented and discussed. Members of the Advisory Board will provide advice on policy issues for the journal and aid in the selection process of the specific themes for particular issues of the journal. Junichi Ujiie (Japan): Senior Advisor to the Board, Nomura Holdings Inc.
Osamu Watanabe (Japan): President, Japan Petroleum Exploration Co., Ltd.